The Foreign Ministry will issue a White Paper to explain its handling of the Preah Vihear temple issue with Cambodia. Virasakdi Futrakul, the permanent secretary for foreign affairs, said the White Paper, which will be in Thai and English, is expected to be issued early next month. It will be distributed to the public once available. He said the ministry had never changed the negotiating team, which was made up of legal experts in its dealings with Cambodia. The team leader, Virachai Plasai, was removed as Treaties and Legal Affairs Department chief after Foreign Minister Noppadon Pattama assumed office after the general election. ”The negotiating team is still the same team. The deputy negotiator during the Unesco-brokered meeting in France [last month] was Thai ambassador Thana Duangrattana, who was the former chief of Treaties and Legal Affairs. He knows the Preah Vihear temple issues well and the borderline,” said Mr Virasakdi. He said the Foreign Ministry was not the only agency involved in the talks with Cambodia. Other security agencies including the Royal Thai Army, the National Security Council (NSC) and the Royal Thai Survey Department also took part in the process. ”We worked like an iron fist in satin gloves. Part of the success must be credited to the military too because it worked in coordination with its Cambodian counterpart,” said the permanent secretary. He said the government had done its best to protect Thai sovereignty under the framework of existing international laws. For the 4.6-square-kilometre overlapping zone next to the temple, Mr Virasakdi said it would be demarcated in the future as it has been included in the working plan. 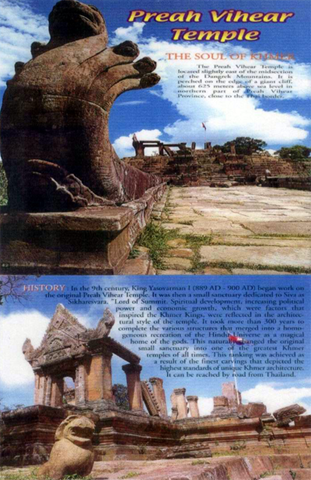 ”Cambodia’s registration of Preah Vihear as a World Heritage Site will not affect the borderline under the 1962 cabinet resolution and the overlapping areas will be the responsibility of the Thai-Cambodian Joint Boundary Commission to discuss further,” he said. The Senate Committee on Foreign Affairs announced on Thursday it will ask the World Heritage Committee to postpone its consideration of the Cambodian request. Mr Virasakdi said the World Heritage Committee only listened to government representatives and the Senate committee might be wasting its time. Preeyanantana Rangsit, a senate member, took Mr Noppodon to task in parliament for allegedly trying to rush through the temple deal with Cambodia. In a query raised during an upper house meeting, M.R. Preeyanantana asked why the minister endorsed the Cambodian proposal in a rush and the ministry did not bargain with Phnom Penh to make Thailand a co-host of the proposal. The senator said the Foreign Ministry had failed to keep the public informed about Preah Vihear as required under Article 109 of the constitution. Entry filed under: News. Tags: Preah Vihear Temple.